"I didn't have a good match getting into the finals, so I knew I had to fight for third," says Tong. Going into the bronze medal match, the pressure was on. "Gotta medal, I thought," Tong recalls. "I finished the match really quickly, in 30 seconds. I threw the girl and then pinned her. I got a yuko for the throw and went into a pin, held her for 25 seconds. Once I finished that match, I was so relieved!" Tong's win at the Pan Am games enabled the U.S. to qualify her division, the 78kg category. "The U.S. actually qualified each division for the Olympics," marvels Tong, noting the difficulty of having a team field a member for each weight category. Only a year ago, USA Judo coaches Steve Cohen and Ed Liddie predicted as few as six players making the team. Amy Tong (left) and Sandy Bacher on the eve of their trip to Sydney. 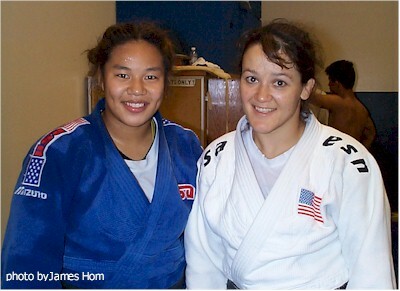 Tong's training base in San Jose, California lets her train with other top judo players, including teammate Sandra Bacher, whose trip to Sydney will be her third Olympic Games. Bacher, the U.S. representative in the 70 kg category, is a fourth-degree black belt with an impressive record, including gold medals at the last four national championships.